Virginia Opossums breed two or three times each year, from February through September. The average litter contains six to nine babies. Opossums remain in the mother's pouch until they are two months old. Between two and four months of age, they may ride on their mother's back and are dependent on the mother for help in finding food and shelter. Is the animal injured (bleeding, broken bones, wounds, deformity, etc.)? If YES, contact your nearest wildlife veterinarian or rehabilitator. If NO, opossums that are at least 8 inches long from tip of nose to the base of the tail (do not include the tail) and weigh more than 7.25 ounces or 200 grams are old enough to survive on their own in the wild and do not need human intervention. If the opossum does not meet these size and weight criteria, contact a state permitted wildlife rehabilitator immediately. 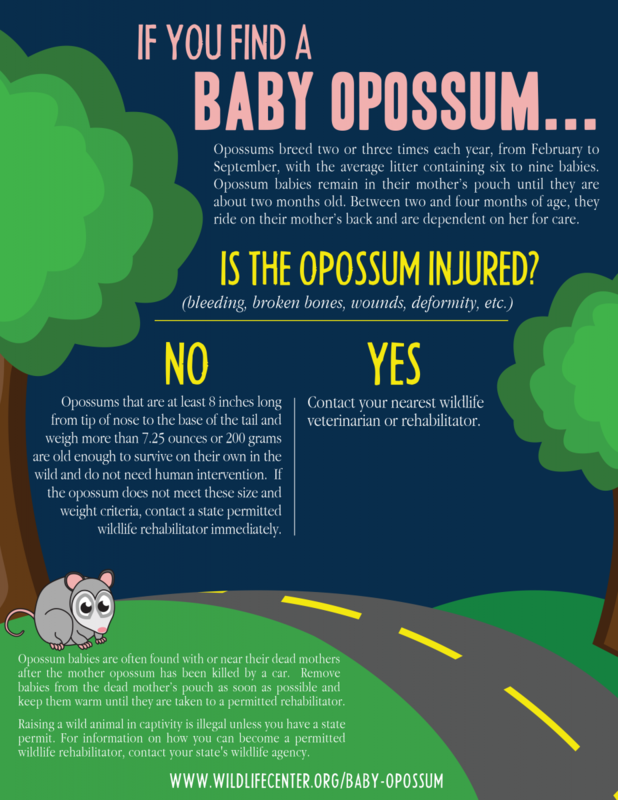 Opossum babies are often found crawling around next to their dead mother [often after the mother has been killed by a car] and will not survive at this age without human care. NOTE: Raising a wild animal in captivity is illegal unless you have a state permit. For information on how you can become a permitted wildlife rehabilitator, contact the Wildlife Center of Virginia, the Virginia Department of Game and Inland Fisheries [PDF] or your state's wildlife agency.